Dan L. asks: Why did shaking polaroid pictures help them develop faster? For anyone unfamiliar with the 2003 hip-hop hit, Hey Ya! by OutKast, the line “shake it like a Polaroid picture” is repeated over a dozen times. The accompanying music video released alongside the single saw the line punctuated by a bunch of attractive women shaking recently taken Polaroid photos, along with their various wobbly bits, with dangerous levels of enthusiasm. Wanting to capitalize on the success of the song, Polaroid got in contact with OutKast and quietly bankrolled a number of parties to be headlined by the group. Polaroid deliberately avoided overtly advertising during the events, instead simply hiring people to hand out new Polaroid cameras to the celebrity guests in attendance. As Polaroid expected, the celebrities took pictures with the cameras and dutifully shook them during the song’s chorus, making the brand seem just all kinds of cool with the ever impressionable public. Polaroid also gave the group new instant cameras that they took on stage during events, notably the Grammy’s and an appearance on Saturday Night Live. 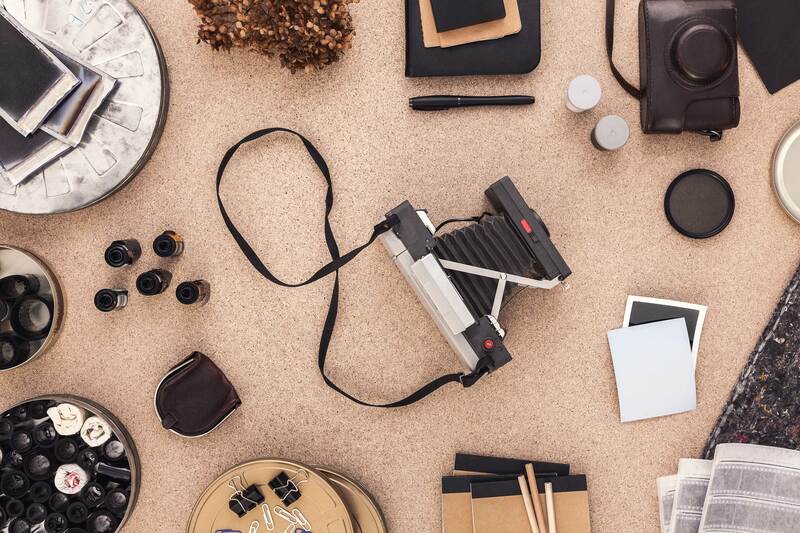 With people once again interested in Polaroid instant cameras, there was just one more thing the company had to do- ask them to not do the one thing everyone associated with their most popular product. Given this, you might now be wondering why it has long been a common practice to wave Polaroids back and forth in the air directly after you take a picture- something that no doubt ultimately inspired the lyric by OutKast. This practice has its genesis in the early models of Polaroid cameras, particularly those that used packfilm, otherwise known peel-apart film, where you had to physically peel apart the positive and the negative after the photo had developed. Polaroid themselves notes, “Peel-apart versions of the film needed to dry before it could be handled, so waving the photo helped it to dry more quickly”. Given the design here, waving with peel-apart film didn’t risk blotching as with subsequent generations of instant film developed by Polaroid. That said, it should be noted that such waving wasn’t actually necessary even then. One could just leave the photo to dry naturally. However, in the 1970s, Polaroid introduced their third generation of cameras, such as the SX-70, among others, that used a new, and now iconic, square format integral film where shaking, or really doing anything at all but waiting for the picture to finish developing, was entirely unnecessary- everything was contained in the film, with no need to peel or dry anything. Despite this, even after Polaroid improved their instant development process, people continued to shake the Polaroid pictures back and forth in the air until the picture finished developing, seemingly blissfully unaware that this is entirely unnecessary, and even potentially counterproductive to the ultimate successful development. Who was the Woman in the Famous Great Depression Photograph? Though Polaroid never released any official figures related to sales after the release of the song, it apparently wasn’t enough to save the company. They had to declare bankruptcy in 2008 and were rebranded the Polaroid Corporation later that year. This marked the second time in the same decade the company did this, having declared bankruptcy in 2001 as well. Despite these setbacks, they still produces instant cameras, among other product, which continue to produce photos that some people shake for no particular reason. Why The Scooters Have Polka Dots Target and others embrace stunts to cut through the clutter. The split type film came with a plastic tube. Inside was a device saturated in plastic protectant. After the negative was split off from the positive, the user wiped the protectant over the positive. That was the stuff that had to dry. Some did, but others did not. I suspect people continued to wave the later generation photos thinking it worked the same way, but the peeled-off part got retracted back into the cartridge.